The focus of this chapter is the imagined world that Nathaniel Mackey creates in Splay Anthem, a book-length poem that depicts a devastated urban landscape traversed by a lost band of travelers. Lagapa argues, however, that the book’s dystopian spaces, strewn with amputated bodies and beset by widespread social deprivation, unexpectedly hold the key for utopian realization. 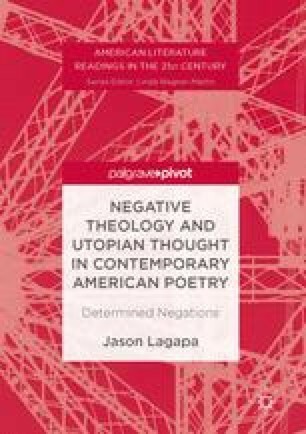 The potential for utopian social change, Lagapa contends, is encapsulated in Mackey’s repeated use of the phrase “not yet,” a negative construction that recalls the importance that Ernst Bloch places on anticipation in utopian thought. Mackey’s travelers, having “not yet” arrived, find themselves perpetually cut off from their destination, yet they continue to anticipate an end to debilitating social conditions as they seek a path toward utopia.